La Monarca is the world’s first Solar Mural installation; it is a Land Art Generator artwork—a piece of public art that produces renewable energy. This new art form has been promoted most prominently on a global level by the Land Art Generator Initiative. 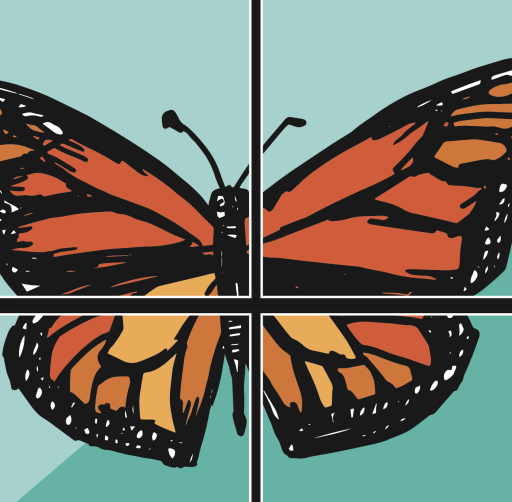 La Monarca, a giant lotería card celebrating the 24 actions pledged by San Antonio to achieve this City’s status as the National Wildlife Federation’s first Monarch Butterfly Champion City, includes an image by San Antonio artist Cruz Ortiz. The 37.9” by 64.25” image is printed onto a special solar-energy-producing film provided by Sistine Solar. The film visually masks the standard dark blue solar cells, replacing them with the beautiful La Monarca image. At the same time it allows sunlight through to the solar module so that the cells can still function to generate electricity. When assembled, four panels are stacked 2×2 at a vertical angle, measuring 6’6” wide by 11′ tall; each panel stands at 66” x 40”. The Solar Mural artwork was unveiled at Luminaria, San Antonio’s 10th annual contemporary arts festival, held at Hemisfair from 7pm to midnight on Friday, November 11, 2017. There La Monarca sat upon a grassy hilltop between two of Hemisfair’s three historic 1960s-era “Confluence of Cultures” murals: Juan O’Gorman’s stone mural on the façade of the Lila Cockrell Theatre and Carlos Merida’s glass tile mural on the Convention Center. Power from La Monarca was used to illuminate the artwork itself that night. La Monarca also was shown to thousands during the San Antonio Zoo’s Monarch Fest, March 2-3, 2018 (photo above). La Monarca will find a permanent home in 2018 inside a pollinator garden on the EPIcenter campus along the Mission Reach of the San Antonio River where it will generate solar energy that will feed directly into the property’s power supply. La Monarca has been a collaboration between Land Heritage Institute (LHI)’s LHI Art-Sci Projects, EPIcenter, the Local Initiatives Support Corporation (LISC) and the Land Art Generator Initiative (LAGI). The project has been made possible through support from the Alice Kleberg Reynolds Foundation, EPIcenter, OCI Solar Power, Mission Solar Energy, Sun Action Trackers, Sistine Solar, Texas Commission on the Arts and the National Endowment for the Arts. Las Monarcas will be a swarm of Monarch Butterfly-inspired Land Art Generator artworks to be designed for placement at and to provide power to social service centers, municipal buildings or eco-cultural tourism destinations in the City of San Antonio or other stops along Monarch Butterfly migration routes serving as emblems for the full range of issues the Monarch Butterfly has come to represent: metamorphosis and emergence; species extinction due to global warming and climate change; immigrant, exile and refugee rights; and, now, renewable energy and regenerative design.